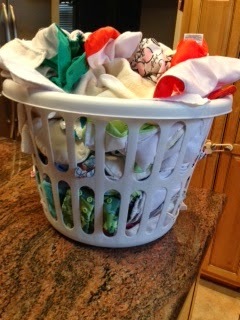 Thanks so much to my friend Lisa who is coming back today with a Part two of Modern Cloth Diapering. 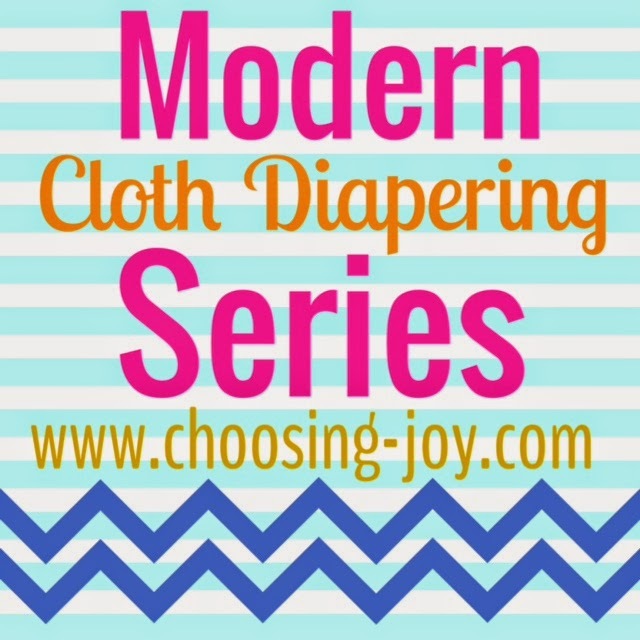 You can check out Part One here about the basics of Cloth Diapering. 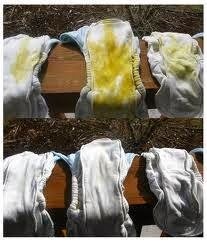 Now that I’ve given you information about the specific types of diapers, more importantly is how to get them clean! Smelly diapers are dirty diapers. Besides diaper rashes, smelly diapers are the main reason people throw in the towel when cloth diapering. Please be forewarned that some diaper companies like Bumgenius have very specific washing guidelines in order to retain your warranty. Please follow those specific washing instructions or be prepared to void your warranty. I choose to follow my own wash routine. 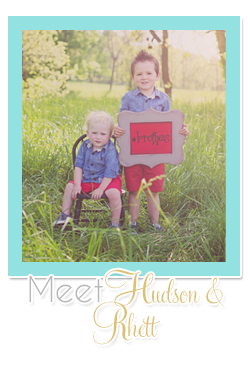 I can repair a broken snap but I refuse to mess with stinky, dirty diapers! 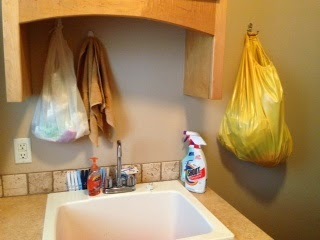 Storage: The best method I’ve found is a large hanging wet bag near where I spray my diapers. It holds around 25 diapers and is off the floor (away from my roaming toddler). A tall plastic trash can works well too. They make washable pail liners or you can just wipe it out with a Clorox wipe between washes. You can throw the wet bag and pail liner in the washer. Here’s a picture of my “diaper central.” I have a large hanging wet bag, shout, antibacterial cleaning agent, plastic bag for disposable wipes and liners, hand soap, extra clothes pins, and the bin for washing. Diaper stew not diaper soup. No matter what kind of washing machine you have your diapers need to be rubbing against each other in order to get clean. Without friction, they will not get clean. But you also have to be cautious as too many diapers are just as bad. The perfect load size is about 14-16 diapers, which for most families means you’re washing every other day. I have 2 children in cloth diapers so I wash every 1.5 days. Poop: Yep, we’re going to talk about poop. If you can’t touch your child’s poop, get some rubber gloves or don’t cloth diaper because it’s necessary. I have designated the utility sink in my laundry room as diaper central. I also have a sprayer attached to a toilet for those chunky days. It’s essential to get poop off before washing and yes this includes breast milk poop. Poop is poop! If neither of those are an option you can use a rubber spatula and store it near the toilet, your hand held shower sprayer if it reaches your toilet, garden hose outside, or dunk and swish in the toilet (I don’t think it’s very effective). Tip: sometimes letting poop dry overnight on the diaper makes it easier to get off! Detergent: You will ruin cloth diapers by using any detergent with fabric softener. NO FABRIC SOFTENERS! To avoid this problem I stopped using fabric softener at all in my washer. Powdered detergent works better than liquid because it washes out easier, avoiding any build-up. Diapers are just like any other clothes and they need detergent to get clean. I’ve heard of people using a tbsp. of detergent and other nonsense like that. If it won’t get clothes clean it won’t get diapers clean! Use the appropriate amount of detergent per load size. For most of us washing diapers every other day that would be up to line 2 on the measuring cup. I have used Arm & Hammer, Tide, and All powders without issues. I currently use Arm & Hammer. For sensitive skin there are free and clear versions. Stains: Poop stains, but there are things you can do to help. I use Shout stain remover while spraying them in my utility sink. I use some elbow grease and hand wash most of it out. Some moms I know use Oxi-Clean in the washer but I’ve found that it doesn’t do much for stains and can get expensive. My best advice is to use the sun! The sun’s UV rays works like natural bleach. They reduce stains and kill bacteria. 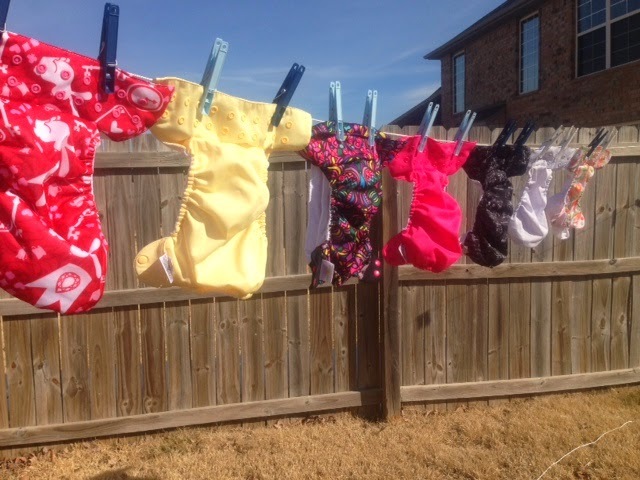 Just lay your diapers out wet and let the sun do its work. I’ve sunned with snow on the ground! If you don’t have a clothes line you can lay them on drying racks, chairs, the ground, or hanging by a window. It’s amazing! Just don’t leave covers in the sun too long. And hour is enough because it can break down the inner waterproof lining causing cracking and leaks. Look at the amazing before and after pictures of sunning for stain removal! o if you suspect there is still detergent on the diapers (lots of bubbles left) just do an additional rinse/spin and decrease the amount of detergent to line 1. Drying: I always prefer to line dry everything. It not only gets the benefits from sunning but doesn’t cost anything and saves energy. But there are days where I can’t (rain) so I have to use the dryer. Anything with a waterproof cover (pocket diaper, covers, All in Ones) should be hung dry. This will lengthen the life of the PUL and elastics. Grab some plastic pant hangers and you can get 2 diapers on each hanger. Putting them near a heat source such as a vent or the window will increase drying time. Everything else can be dried in the dryer on high heat. Pockets and all in one diapers can get “crunchy” after line or air drying so tossing them in the dryer on low heat for 5-10 minutes will bring back the softness. Then it’s fluff laundry time! I absolutely hate doing any laundry but diaper laundry. Sometimes I fold every other day and sometimes I let 4 days build up before putting it all away. This is about two days worth for 2 children. I encourage you to ask questions! I would love to hear your feedback as well. 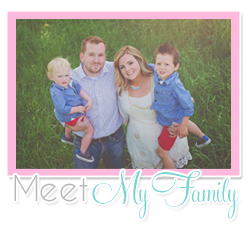 This has been so much fun for me because my husband says he can’t take anymore “diaper talk”! I think my next series will be trouble shooting. Until then, God bless! 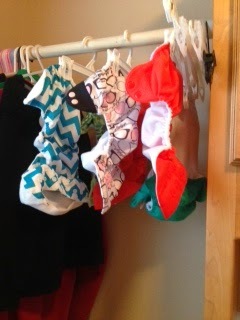 This is going to sound crazy but I LOVE doing cloth diaper laundry, especially hanging them out on the line and "re-stuffing" them. Since Rhett has sensitive skin I make my own cloth diaper detergent and it works so great. You can check out that recipe here. Have a great day friends!